Merciful magistrates have given a former homeless man who has led a life of drug-taking and begging a chance by sparing him from a further prison sentence. 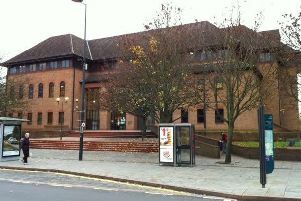 Chesterfield magistrates’ court heard on Wednesday, June 27, how Dean Green, 37, risked going back to prison for 14 days when he failed to attend court after also failing to comply with supervision requirements imposed following his release from prison. Defence solicitor Denney Lau said Green is mentally unwell and he has had issues with the zombie-drug Mamba and begging and he has become paranoid after he was attacked by someone with an axe. Mr Lau added: “For the last year or so he has been living outside the Victoria Centre. “He’s been on Mamba and gets caught for begging but that isn’t the life he wants to lead and he doesn’t want to be homeless and he wants to move on from all this. Green, of Longcroft Court, Grangewood, Chesterfield, admitted failing to attend court after failing to comply with supervision requirements including probation meetings imposed following his release from prison on May 16. Chairman of the magistrates’ bench, Norman Shaw, said: “Sending you back to prison is kind of a revolving door. You come out, you do something, you go back in. “But you have found some accommodation. You are not sure if its permanent but it’s a start. Magistrates opted to spare Green from a custodial sentence and instead fined him £40 and ordered him to pay a £30 victim surcharge and £60 costs.